I’m playing good. Better than I’ve played in a long time. Likely, it was how Deane Beman had always envisioned it while drawing up plans for THE PLAYERS Championship: Brilliant weather, large crowds, a tantalizing and pure golf course, and the best golfers in the world competing for a prestigious prize. But as he walked and watched the final group in pulsating sunshine Sunday, it’s unlikely the PGA TOUR Commissioner had ever envisioned such flawlessness. On the strength of 70-69-69 Peete pushed to 8-under and was tied with Hale Irwin and D.A. Weibring through 54 holes. With the brilliance of a bogey-free 66, Peete turned the Stadium Course into his own little playground. It was emphatic stuff early (Peete birdied the first two holes; Irwin went 4-over for his first five) and the finishing kick wasn’t bad either (Peete birdied four times coming home). At 14-under 274, Peete beat Weibring by three while Irwin shot 75 and faded into a share of fifth. Impressive, yes. But no one who studied the landscape would have called it a surprise, not with Peete’s uncanny driving ability. It was Peete’s ninth PGA TOUR win since 1982, and no one had won more in that time frame. “We finally won a major,” Peete said, as he walked off the 18th green. No one in attendance would have disagreed with him. 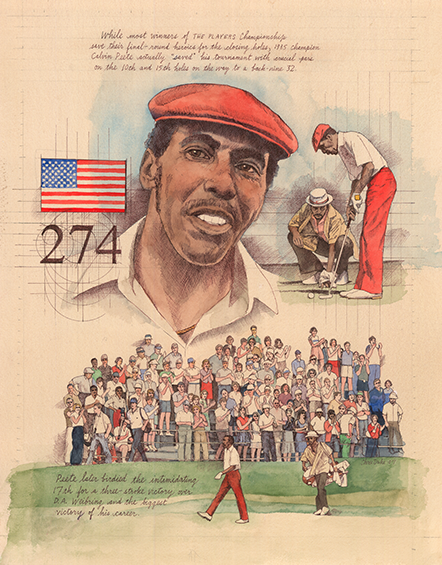 While the two years previous had seen the record broken for the tournament’s youngest winners, 41-year-old Calvin Peete, became the oldest player to take the title with a three-shot victory over D.A. Weibring. Despite a concerted effort from Weibring to chase the pin-point accurate Peete down, birdies down the stretch on 12, 13, 14 and finally on 17 assured Peete that the title was his.